Chris Drake is known about Carleton Place for his warm smiles, his enthusiastic cheers at local regattas and hockey games and his varied and colourful art. 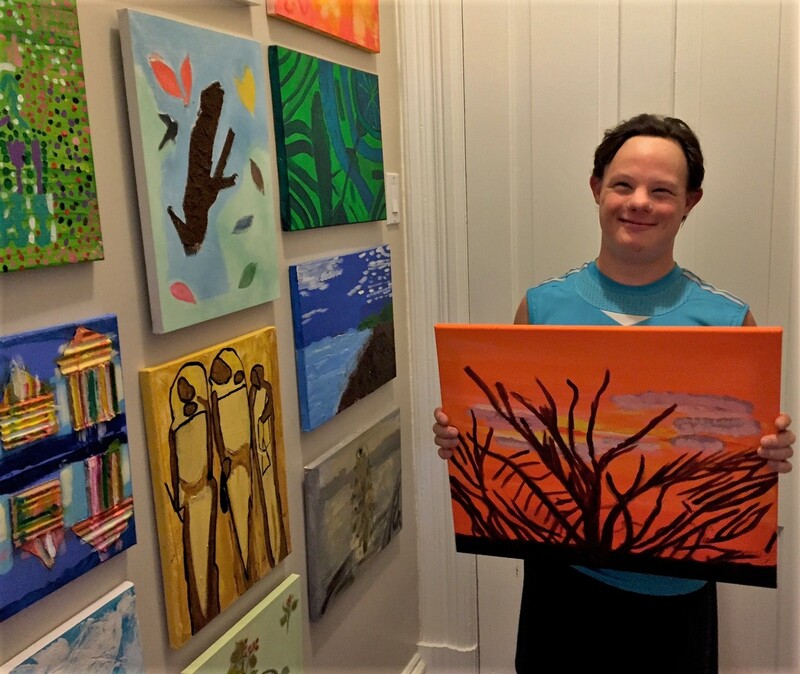 While he always liked doing art, it really took off in High School where he participated in his first art show, sold his first painting and helped inspire his teacher, Sarah Jaynes, to hold a workshop for students with cognitive challenges like him, thus starting Without Exception. Chris participated in all 10 workshops. Chris regularly submits to the Jane Cameron Art Award, received honourable mentions in 2008 and 2009 and won the award in 2010. His art has been displayed at the Carleton Place and Beckwith Heritage Museum, the Lanark Community Programs office in Carleton Place and a small restaurant in Hintonburg. As well he has pieces at Surrounding Memories and Temptations on Bridge St. in Carleton Place. 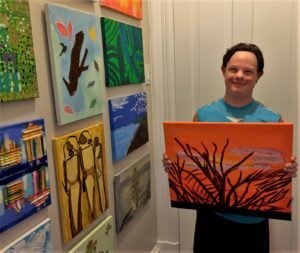 Since leaving school Chris, helped found the Carleton Place Social Rec Program, where he and others like him learn life skills, have work placements, do art and more. He attends an art group with his girlfriend, Gen at Temptations on Thursday afternoons. Chris is active in sports, doing everything from hockey to paddling. And he inspired his brother to start Stay Smiling Partners, a website designed to support artists with cognitive challenges, like Chris, and help them earn an income from their art.